Amby Burfoot is a legend in the running world. Not only did he win the Boston Marathon in 1968 (2:22:17), he remained one of our nation’s top runners for many years, if not decades. Amby was also the Editor-in-Chief of Runner’s World for eons, and was inducted into the National Distance Running Hall of Fame in 2008. Today he continues to run, write, and work as Editor-at Large for the magazine. Putting all his running and writing accomplishments aside, here’s why Amby Burfoot is legend in my mind: his kindness and generosity. You see, Amby was the first person to ever “officially” hire me as a writer. 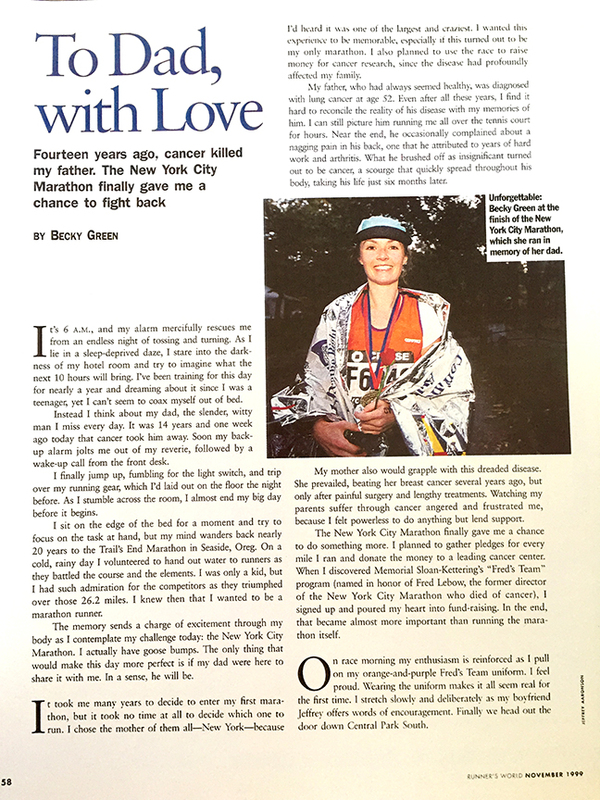 I had just run my first marathon and felt compelled to write a story about what it meant to run through the streets of New York City in honor of my dad, who had died of cancer when I was 18. I nearly fell out of my chair. First of all, writers never, ever, EVER receive a reply that quickly from busy editors. Second, writers with zero writing credits to their name rarely ever receive a “Yes” from a national publication. To this day I have no idea why Amby said yes, but that vote of confidence sixteen years ago changed everything for me. It made me believe that I could pursue my passion for the written word, and it also reinforced the idea that good things always happen when you put yourself out there and push beyond your comfort zone. A few months later, “To Dad, With Love” was published and a check arrived in my mailbox. I nearly fainted all over again. I still have the check stub from that first article as a sweet memory, and as a reminder that you don’t have to be great to start, you just have to start. Because Amby Burfoot took a chance on me, I was able to start. Do you know what else knocked my socks off? He hired me again—this time for a dream assignment—to write a story about running on the Roof of the World in Tibet. My dear friend Janet and I had planned an adventurous “girls trip” to Tibet in 2000, and I wanted to write about running at Mt. Everest base camp and other points throughout the country. Once again, I sent Amby an email query and once again I received a zippity-doo speedy response with an affirmative answer. Although I didn’t fall out of my chair this time, I did have to pinch myself. To be able to chronicle one of the most remarkable adventures I can remember for one of my favorite magazines was a dream come true. It was epic. “Running on the Roof of the World” was far better than the first article I had written for Amby (it even went on to win a couple of awards), but sadly, it was never published in the magazine because 9/11 happened and all international adventure travel stories were nixed for a good long time. Regardless, I will never forget the enthusiasm, kindness and generosity Amby showed all throughout the writing and editing process. Even though I’ve never met Amby in person, I’ve always gotten the feeling that he’s a regular, hard-working, humble guy who remembers where he came from and is happy to pay it forward. 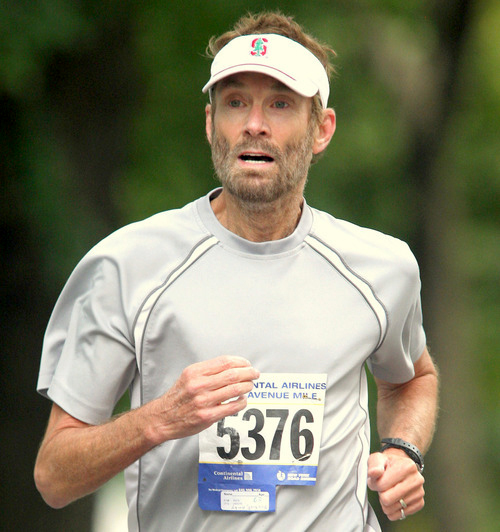 The reason I’m mentioning Amby Burfoot here on my blog today is because I happened to run across an article again that he wrote back in October 2012, “Simple Secrets to a Lifetime of Running,” which celebrates his 50-plus years or running. “Running is easy: Put one foot in front of the other. Staying motivated to run requires much more. It takes thinking and planning. It takes believing in yourself and the value of your workout time. It takes a powerful web of attitudes and practices that make your daily exercise as regular as, you know, brushing your teeth. Here’s to running longevity and to Amby Burfoot, a person who symbolizes all that is good and authentic in the running world. Thank you for inspiring me, and for helping launch my career. Most of all, thank you for reminding me of all the reasons I love to run.